SPACEWAYS IN THIS ISSUE OF SPACEWAYS SHORT STORY The Martian Idol Henry Andrew Ackermann 13 ARTICLES Learn To Type! Frederick Pohl 5 Are the Classics Classical? Tom Wright 11 Fantasy - 1919 Style Walter Sullivan 12 Commentary on Miske and Stardust Larry B. Farsaci 15 More Fantastic Films Walter C. Liebscher 17 Fantasy Music (part I) James B. Blish 18 HUMOUR Confidential Notes on Editors Bob Tucker 8 POETRY Moestitiae Encomium Earl Singleton 4 Ode to a KaleidoscopePaul Vogenitz 10 REGULAR DEPARTMENTS Cover Jack Fields 1 From the Control Room Editorial 3 Beacon Light S F Cynic 6 What They are About J. Michael Rosenblum 16 The Readers Always Write Letters and Poll Results 26 Back Cover Harry Jenkins 26 Advertisements 24, 25 Editor: Harry Warner, Jr., 305 Bryan Place Hagerstown, Maryland Associate Editor: James S. Avery, 55 Middle Street, Skowhegan, Maine. Art Editor: Walter E. Marconette, 2709 E. Second St., Dayton, Ohio Spaceways: vol. 3, no.3, whole number 19. Issued eight times a year: twice every three months. Price: 10c per copy, 3 issues for 25c. In England and Australia: 1/3 for 3 issues; no smaller foreign subscriptions accepted. Britishers wishing to subscribe should remit all moneys to our English representative, J. Michael Rosenblum, 4, Grange Terrace, Chapeltown, Leeds, 7, England. 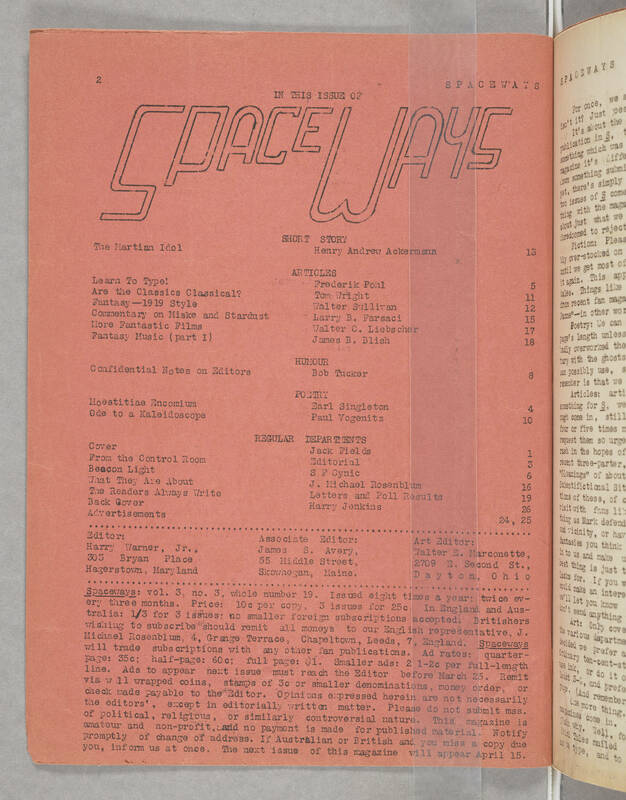 Spaceways with trade subscriptions with any other fan publications. Ad rates: quarter-page: 35c; half-pages: 60c; full page $1. Smaller ads: 2 1-2c per full-length line. Ads to appear next issue must reach the Editor before March 25. Remit via well wrapped coins, stamps of 3c or smaller denominations, money order, or check made payable to the Editor. Opinions expressed herein are not necessarily the editors', except in editorially written matter. Please do not submit mss. of political, religious, or similarly controversial nature. This magazine is amateur and non-profit, and no payment is made for published material. Notify promptly of change of address. If Australian or British and you miss a copy due you, inform us at once. The next issue of this magazine will appear April 15.